While the Plains, Midwest, and Northeast will be dealing with potentially historic snow and ice from the storm system crossing the country over the next 36 hours, here in the Mid-South, we will have a chance, albeit low, of severe weather. An overview of the lower Mississippi River Valley and southern Plains during the late afternoon hours Tuesday is shown below. You can see that the low pressure responsible for the brutal weather to our north will pass very nearly over the metropolitan area. Heavy rain will surround the low, so I expect we'll see widespread rain totals of an inch of rain or more here. Thunderstorms will also be likely ahead of the cold front that will move through late tomorrow afternoon, though the greatest threat will be in the areas in the SLIGHT RISK region defined by the Storm Prediction Center in the map below. Thunder will still be a decent possibility in the metro area however, particularly from noon until the front passes through, which should be by 6pm. The primary threat from any thunderstorms will be damaging straight line wind, especially along a potential squall line that will accompany the front. Winds at about 5,000' above the surface will be screaming at 80-90 mph, so any downward momentum generated by thunderstorms could bring high winds to the surface. Even without storms, the wind will be howling at 25-35 mph with gusts to 40+ during the afternoon and evening Tuesday. Behind the front, look for a very rapid temperature change, thanks to strong Arctic high pressure building in behind the front. Temperatures could drop 20-25 degrees in a couple of hours, from the 60s head of the front to the 30s behind it. In fact, any lingering precipitation could change to flurries or a light snow shower after 9pm, though no accumulation is expected. By Wednesday morning, low temperatures will be in the mid 20s and Wednesday's high in the mid 30s will be nearly 30 degrees colder than Tuesday's high. 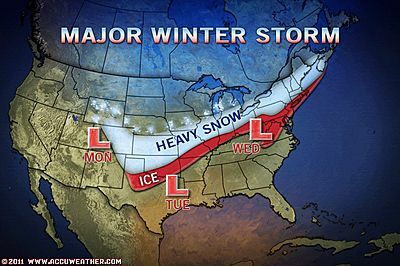 Huge winter storm this week - what are the impacts on the Mid-South? The 24-hour news and weather channels are all abuzz about the "Groundhog's Day Storm" of 2011, which could adversely impact up to 100 million people, according to Accuweather. Truth be told, it's more than just a Groundhog's Day storm. This monster system will impact locations across the Plains tomorrow with snow, while ice accumulation will begin across the Heartland from St. Louis east to Cleveland. Tuesday looks to be the biggest impact day as the storm system sweeps quickly across the Midwest into the Northeast. Ice accumulations of 1/2" or more are likely just north of the Ohio River, affecting places like St. Louis, Indianapolis, and Columbus, OH, while significant ice is also likely in Cleveland, Pittsburgh, Philadelphia, and into the NYC metro. That will be followed by potentially heavy snow on top of the ice, as well as places further north like Chicago, Detroit, Toronto, and much of New England. The map below is courtesy of Accuweather. 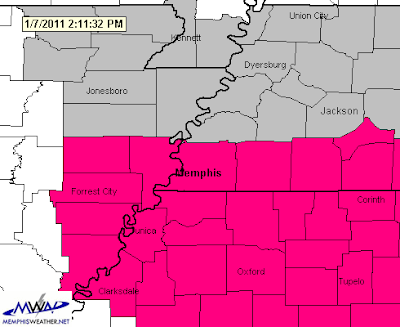 So what about the Mid-South, since that IS what MemphisWeather.net specializes in? While last week the storm track appeared to be slighty further south, fortunately most models have narrowed in on a track that takes the low pressure system from eastern TX across the Mid-South (just north of the metro area) into Kentucky. Given all of the weather types that will exist for this storm, that is probably the best track it can take for us. The major wintry precipitation will be to our north and the highest potential for thunderstorms will be to our south. Our main concerns will be the possibility of flash flooding due to heavy rain on Tuesday and high wind, also on Tuesday afternoon and evening. A changeover to light wintry precip will still be possible early Wednesday though. The maps below show a few different computer models and their respective forecast positions of the surface low pressure at 6pm Tuesday. The European, GFS, and NAM all have a similar track with the European lightly more progressive (faster) than the U.S. based models. The Canadian model seems to be a northern outlier, taking the low over southern IL Tuesday evening. You can see that heavy rain is forecast with this system (perhaps 1-2" on Tuesday) and the tightly-packed isobars (concentric circular lines around the low) indicate that there will also be quite a bit of wind at the surface. In fact, the wind just ahead of the low at about 5,000 feet could reach 75-80 mph! If any of that wind were to be transported to the surface by downdrafts from thunderstorms, it wouldn't be hard to get a severe storm with damaging straight line wind. On average, surface wind will likely gust from 30-40mph Tuesday afternoon and evening. As the low passes by, temperatures will plummet. Early indications are that it will be near 60 just ahead of the cold front (about 6pm Tuesday) and could fall to near 30 by midnight! Any lingering precipitation could changeover to wintry precipitation late Tuesday evening, but I expect everything to move out quickly - by early Wednesday - as the storm races into the Ohio Valley. MemphisWeather.net will continue to keep you apprised of the expected conditions and any changes to the forecast. Follow this blog, Facebook, Twitter, and the main website for updates the next couple of days. 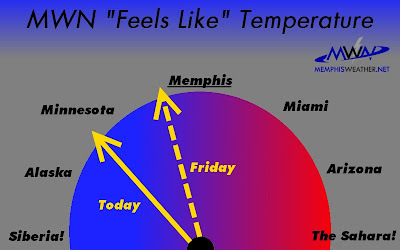 It's included in the climate overview of Memphis on MemphisWeather.net: "If you don't like the weather, stick around, it'll change." That adage is coming true once again. After three winter weather events in 16 days between January 9-25, Mid-Southerners are looking forward to temperatures in the 60s on Saturday - what I call a "bonus day" this time of year. The high temperature is expected to be some 15 degrees above normal tomorrow, while one computer model gives us a long-shot chance at reaching 70. While I wouldn't count on that, with an average high so far this month of just over 44 degrees and snowfall totals that will rank in the top 5 for the month, mid 60s will be a welcome respite! Looking ahead to next week, you may have heard some rumblings about possible winter weather AGAIN. (Is it ironic that it might happen on Groundhog's Day?? I'm thinking Bill Murray...) While the threat remains, last night and this morning's long-range computer models seem to be latching onto a solution that might spare us the worst. Low pressure will be moving out of Texas and towards the region. A track to our south could spell problems. The latest model data indicates it may actually pass over us on Tuesday night. The good news is that would mean a warmer solution and rain, while the bad news could be that a shift slightly farther north would mean thunderstorms. Either way, a blast of cold air looks likely behind this system, so any left over precipitation Wednesday morning could fall as snow. I'm keeping an eye on it and will keep you updated. In the meantime, enjoy this weekend's weather! A little rain is possible Sunday and Monday, but with above normal temps, I'm willing to bet you're OK with that. What do you think? Will we get more winter weather next week? Leave a comment below. 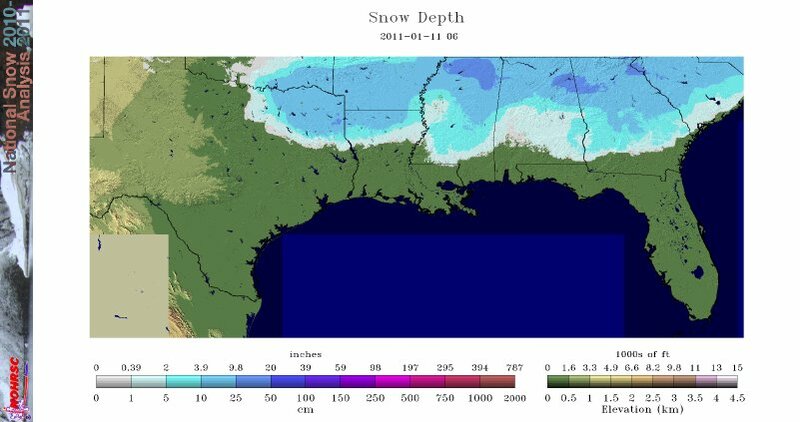 The Mid-South (primarily west TN) received another round of snowfall on January 25 as low pressure moved along the Gulf Coast and an upper-level low moved across north Mississippi during the evening hours. Rain transitioned to snow from west to east during the mid to late afternoon hours, also ending from west to east during the late evening. The map above shows the approximate snow amounts. 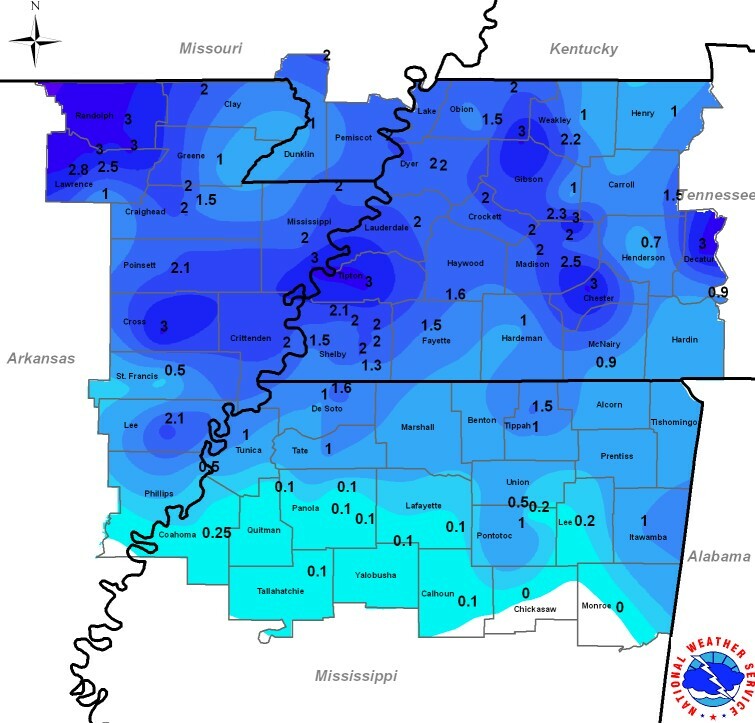 Shelby County totals ranged from less than an inch downtown to near an inch across the center of the county to more than 2" in the northeastern part of the county. 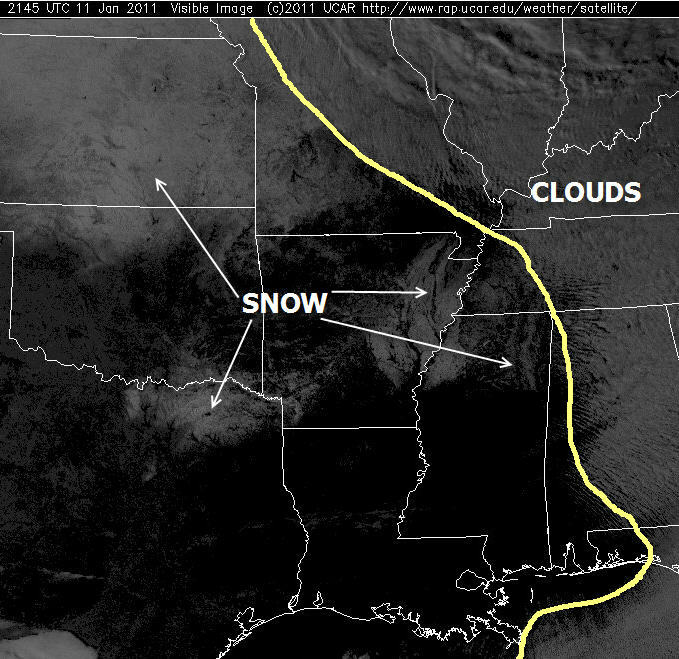 Be sure to check out the previous post showing snowfall as it "disappears" from satellite imagery during the day Wednesday. The list below is provided by the NWS-Memphis. 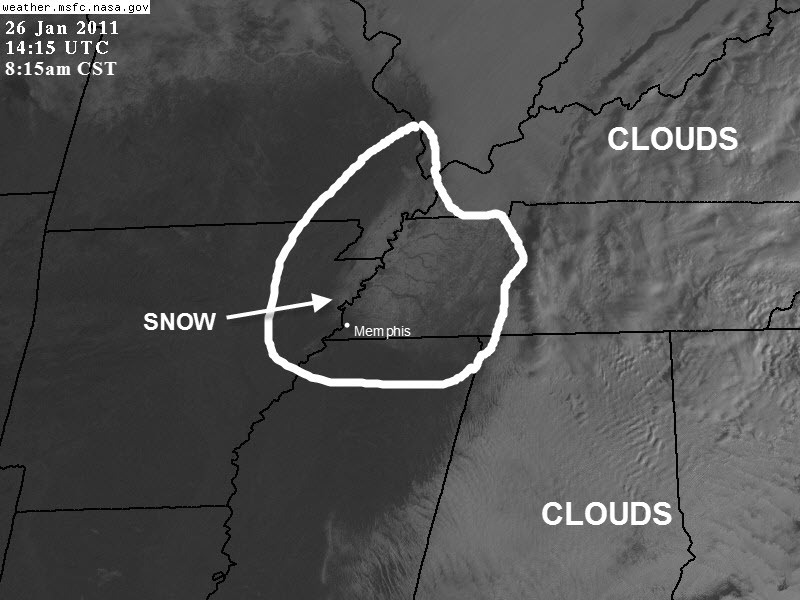 This morning, I described a satellite image that showed snow cover over all of west Tennessee. Well, we all know what happens to snow as temperatures rise into the 40s! Check out the before and after pictures below. 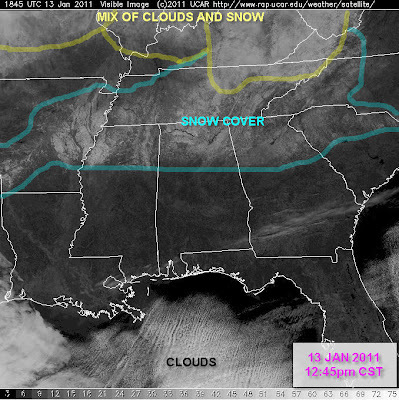 The top image is from 8:15am (used in this morning's blog), the bottom is from 4:00pm.﻿ SnOMG - it's gone! Now you see it, now you don't! One nice thing about clear skies after a snowfall (besides that it means it's over!) 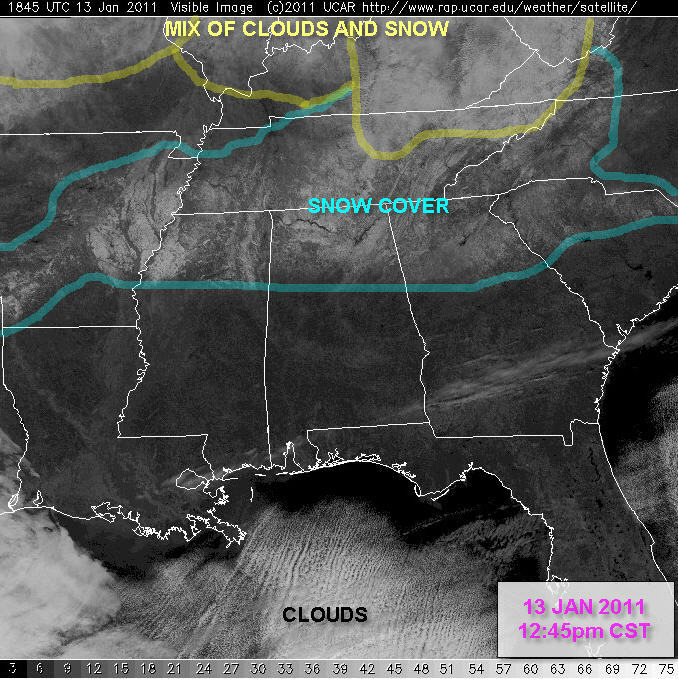 is the ability to see the extent of the snow cover on satellite imagery. Below is one of the first visible satellite images available this morning in which west Tennessee, most of Mississippi, and all of Arkansas are experiencing clear skies. Sometimes it is difficult to separate clouds from snow, so I have done it for you! If you click the image for a larger version, you'll see that the southwest corner of Tennessee (where Memphis is) has varying degrees of "whiteness". At the point where MS, TN, and AR come together, there is almost no snow on the ground, while northeast Shelby County has white ground. This jives well with snow reports, in which streets were whitened in Arlington and Lakeland and nothing was on the ground in western and southern parts of Memphis. 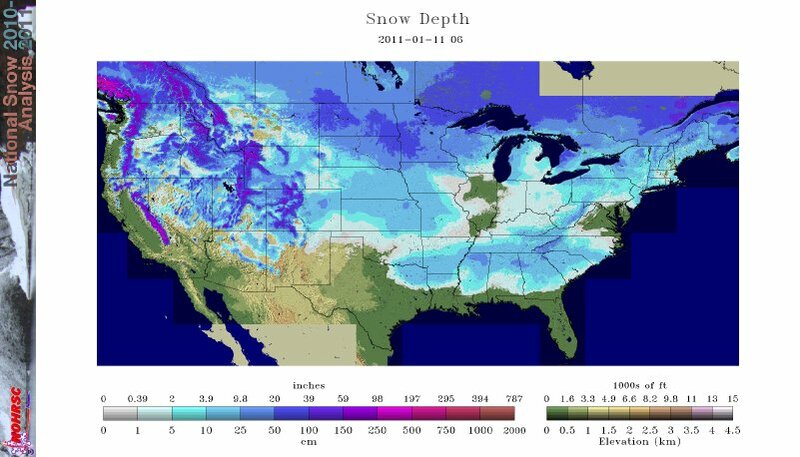 You'll also see the north MS have very little snow cover, other than areas bordering TN, and except far eastern AR, it too is snow-free! Can you see why forecasting snow can be very difficult, given the outcome of this storm? I've had several recurring questions today regarding this winter weather episode. I'll try and address some of them here so that everyone gets the same answer. The rain looks to be moving out. Are you sure it's going to snow? Yes. As the surface low pressure system moves along the Gulf coast and an upper-level low moves in from the northwest, the precipitation over the area will hang around through the evening hours. The approach of the upper low will cool temperatures, resulting in a transition to snow over the next couple of hours (at the time of this writing, light snow is occurring across northeast AR and some sleet is mixing with the rain in West Memphis). How much are we going to get? Really? I'm sticking with 2-3" in the metro area with heavier amounts likely east of the city. Fayette County could see 3-4" and 4-6" is possible east of there. Yes, really. I am not employed by the schools systems, nor do I necessarily understand all of the processes that go into their decision-making. I have spoken with a Shelby County principal who has explained much of it to me though. Bottom line: the schools have closed multiple times so far this year for a few inches of snow. It's fair to believe they very well could for this one too, given that the forecast pans out. How about ice in the morning? Will roads freeze? The snow will be falling after dark, skies will not clear, but there will be a steady wind overnight. Low temperatures will be in the upper 20s and no pre-treatment was done on the roads due to today's rain. I expect to see some icy spots, especially on bridges and overpasses, and secondary roads could be snow and ice-covered in the morning in areas that see at least 2" on grassy surfaces. How long will the snow last? Probably not long in areas that see 2" or less. Tomorrow's forecast is for sun by afternoon with a high near 40. This will take care of all but the most stubborn back roads, and probably a fair amount of the snow on grassy areas. In areas where 3-4" or more falls, it could take more time. Is this unusual to see this much snow in several rounds over just a few weeks? The average snowfall for Memphis per year is 5.7". Last year we got 6.8" So far this winter we've had 5.3". So, while the amount of snow is not "unusual," it does seem to be that the number of snow events in a short period of time (this will make 3 in the past 16 days) is a little unusual, though certainly not unprecedented. Unfortunately, I have to remind you that the Mid-South has seen some pretty decent February/first week of March snows in recent years... it's still winter! Any other questions? Hit me with them on Facebook or Twitter (links below) or comment below. I'll try to answer as many as I can. Remember to get the latest forecast, StormView Radar with winter weather mode, updated watches/warnings, and more, visit MemphisWeather.net! LATE THIS AFTERNOON AND THIS EVENING. INCLUDE THE MEMPHIS METRO AREA. EVENING TO 3 AM CST WEDNESDAY. * SNOW ACCUMULATIONS: 1 TO 2 INCHES. THE RAIN TO SNOW. SNOW WILL TAPER OFF BY MIDNIGHT THIS EVENING. TO 6 AM CST WEDNESDAY. POSSIBLE IN THE MOST PERSISTENT HEAVY SNOW BANDS. BEFORE SNOW TAPERS OFF BETWEEN 3 AM AND 6 AM CST WEDNESDAY. OVERPASSES WILL BE THE MOST TREACHEROUS. Computer models merging towards a possible solution? Thought I'd throw a little more data at those of you who like to see the computer models in action. Below is the output from two different models. First, the evening NAM run, which seems to finally be getting it's act together after insisting we would see little to no snow up until now. Below that, the mid-day GFS, which has been fiarly consistent in it's message of late and did better with the last couple of winter storms. The graphs below are from a program called BUFKIT and I have chosen to display the temperature and dewpoint trends and precipitation amounts. The scales are on the right and these actually read from RIGHT to LEFT (so the frather left you go, the farther out in time you are). The NAM shows light rain overnight and through the day tomorrow, switching to snow around 6pm and ending around 1am. Each vertical bar is 1 hour. It totals about 2.0-2.5" of snow depending on the calculation used to determine snow amounts. The second graph, from the GFS, indicates light rain through the overnight and morning hours, switching to sleet by early afternoon, then snow by late afternoon. It gives the Memphis area 2.5-3" of snow by early morning Wednesday. This is the earliest the GFS has switched Memphis to frozen precipitation and is too early in my opinion. However, it is interesting that both now give us enough to cover the ground once again. We'll see how it plays out, but DEFINITELY something to keep an eye on! This morning's computer models are agreeing on the big picture, but not on the details, which produces two vastly different outcomes, as evidenced by the forecast comparison between two models below. The GFS model on the left, predicts 3" of snow for the Memphis area by Wednesday morning, while the NAM model on the right, keeps the 1" snow just to our east and south. Both of these models predict the surface low to travel along the Gulf coastline at about the same time, though the upper-level systems and degree and timing of cold air aren't quite the same between them, thus the differing forecasts. It's my job to sort out the differences, determine which model (or combination of them) makes the most sense, and issue the MWN forecast. Though I still have a couple of hours to look over the data and make my final decision before this afternoon's forecast is issued, I'm leaning towards the GFS timing and cold air solution right now, but not the GFS precipitation amounts, which I think are overdone. Check out the MWN forecast later this afternoon for my ultimate decision, but at this point I'm thinking a changeover from rain to snow (with a brief period of sleet possible during transition) occurs during the evening hours (6-9pm) Tuesday with about a six hour window of light snow and about an inch on the ground by the time it ends. Temperatures Wednesday morning will be below freezing, so another snow day is not out of the question (yes, I hear you parents groaning...). I expect the NWS could issue Winter Weather Advisories later thisd afternoon and certainly I'll be monitoring each model run between now and tomorrow, posting updates as warranted. 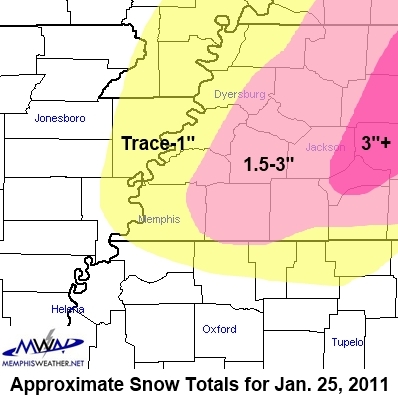 The Mid-South expereinced the second snowfall in less than two weeks on January 20, 2011. Snow began around noon in the metropolitan area and was heaviest during the mid-afternoon hours before ending during the evening rush hour. Skies cleared overnight and temperatures plummeted into the teens, allowing freezing fog to form in some areas, especially rural areas of west TN. Most major school districts were closed on Friday, January 21, as road conditions remained hazardous throughout the morning hours. 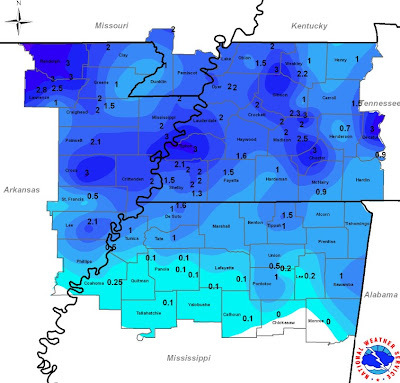 Below is a summary of Mid-South snowfall accumulations as provided by the National Weather Service office in Memphis. At Cirrus Weather Solutions in Bartlett, the snow total was 1.9". Get the latest weather updates by checking out MemphisWeather.net on Facebook and Twitter! A brief update after checking out the overnight computer models, including the high-resolution models that now have the entire snow event period within their sights. The analysis from last night still looks to be just about right on track. I expect light rain to move into the area ahead of the cold front around 11am to noon with the frontal passage expected shortly thereafter. Temps will begin to fall and rain could briefly mix with sleet for an hour or two before changing to all snow by 2-3 pm. Snow will be ending by 6-8pm. I expect widespread 1/2 " to 1" snow amounts with 2" possible north of the metro area. 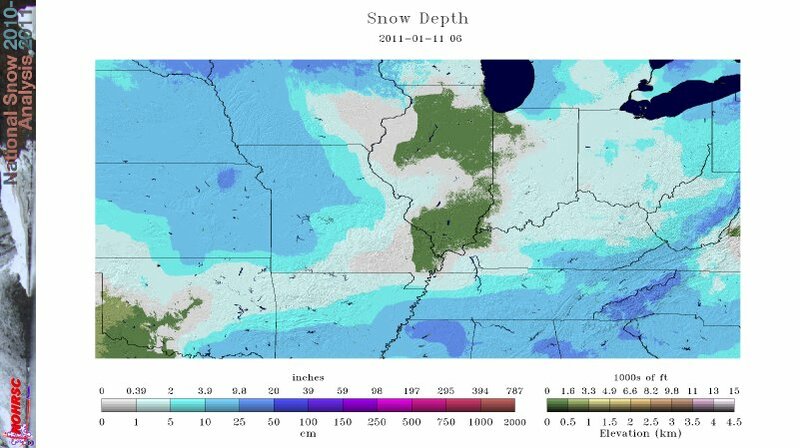 Model data has been trending lower with snow amounts over the past 24 hours. As of 6am, no metro school districts have announced any closings, delays, or early release times. MWN StormView Radar with winter weather mode (click "Winterize" on the radar interface) will keep you updated all day on where the snow is and where it's headed. In addition, we'll be posting updates on our social media channels as developments warrant. You may also want to follow @shelbyalerts for winter weather watches/warnings for Shelby County via Twitter (a free service of MemphisWeather.net) or sign up to receive them by e-mail for any metro county. Get the latest winter weather conditions, forecasts and much more by checking out MemphisWeather.net on Facebook and Twitter! One thing is for certain regarding the winter weather potential tomorrow versus the storm last week -- it won't compare in terms of snow amounts, duration, or degree of cold air behind the front. Until earlier today, the primary two computer models that provide detailed information beyond 24 hours have not agreed well. One (the NAM) has consistently been warmer ahead of the front and wetter behind the front, yielding snow amounts of 3" or more. The other (the GFS) has tempered the warm air ahead of the front reflected in lower high temperatures and has also been less aggressive with precipitation amounts, averaging about 3/4" of snow. Those differences, as hoped, narrowed today and as of mid-day are now very similar. Here is the consensus and most plausible solution this evening: temperatures overnight will fall to near freezing then rise into the upper 30s to near 40 by noon. Light rain could begin by late morning. The cold front will slide through the metro area in the early afternoon and temperatures will begin to fall in the lowest several thousand feet of the atmosphere. As they do, precipitation may briefly change to sleet before becoming snow by about 3pm. Snow will continue for a few hours and taper off substantially after rush hour, ending by late evening. Snow amounts will average between 1/2" and 1" across the metro area with 1-2" not out of the question (see GFS model graphic solution below). Temperatures will fall below freezing around rush hour and bottom out near 20 degrees Friday morning, only reaching the mid 30s on Friday under partly cloudy skies. Recently I had a chance to sit down with Assistant Director of Public Works for the City of Bartlett, Mike Adams. For those not from the immediate area, Bartlett is a 26.6 square mile suburb of Memphis, TN with a population of 50,000 residents, situated nearly centrally in Shelby County. There are several major thoroughfares throughout the city, five fire stations, a hospital, two police precincts, a municipal center, a recreation complex, and all the amenities of a bustling suburban area. Our discussion centered on planning, preparation, and response to the January 9-10 winter storm that dropped 3-4" of snow across the city, beginning Sunday evening and continuing into early morning Monday. The snow storm was enough to close Bartlett (Shelby County) schools Monday and Tuesday and Bartlett city services on Monday. Beginning on the Wednesday before the storm (January 5), Public Works administration was aware of the potential for accumulating snow and notified the General Maintenance division, which is responsible for snow removal and treatment of roadways and public areas. As forecasts continued to indicate the likelihood for snow late in the weekend, Adams said part of Friday was set aside to verify that all equipment was in working order, including checking five trucks equipped with spreaders and snowplow blades (three with 7-ton capacity and large blades and two with 2-ton capacity and smaller blades). General Maintenance personnel were put on standby for the weekend to be called in as soon as problems were reported. Adams indicated that the City of Bartlett does not preemptively treat their roadways with salt brine, though a few of the primary arteries with state highway designations that traverse the city do receive this treatment from the TN Department of Transportation of Shelby County road crews. Public Works crews are typically activated by Bartlett Police Department dispatchers as soon as reports are received from patrol officers of slick spots developing, though in this case monitoring weather radar and seeing the trends in nearby area allowed the General Maintenance manager to call up crews before any real trouble spots started developing. Adams recalled that within an hour of the initial call-up, spreaders were on the primary thoroughfares in Bartlett treating the lanes with a 50/50 mixture of sand and salt to loosen the accumulating snow and speed the melting process, which was aided by traffic. In addition, the largest arteries in the city were plowed after enough snow had accumulated to warrant pushing the snow. These main arteries include Stage Road, Bartlett Boulevard, Kirby-Whitten Parkway, and Summer Avenue/Highway 70, among others. Adams said that the salt/sand mixture was also spread on the drives leading into the city's hospital (St. Francis-Bartlett) and snow clearing was done at the fire stations and police departments, as well as City Hall. The spreading and plowing continued until 1am Monday morning, beginning again at 5am to clean up areas that needed additional attention. Since the possibility of light snow or freezing drizzle existed Monday night, one person from General Maintenance was kept on call in case crews were needed again. Fortunately, no precipitation of consequence fell Monday night and additional clearing or deicing was not necessary. Regarding the mixture that is dropped on the city streets from spreaders, Adams indicated that a 50/50 sand/salt combination seems to work the best as the mixture is most effective between 25 and 32 degrees (temperatures hovered near freezing all night and throughout Monday) and the salt helps to accelerate the melting process, especially when coupled with traffic. It also allows the plows to be more effective. For this winter storm, five Public Works trucks spread a total of 138 tons of salt/sand on Bartlett roadways. In ice storm situations, plows are not used and the mixture that is spread on roadways only does so much. Freezing rain truly is the worst of all situations. Additionally, when ice is forecast, Adams said that all available equipment, including chain saws, backhoes, etc. are tested before the event and crews are made available to help with debris removal, which is not necessary in regular snow events. Adams had one piece of advice with regards to snow removal and road treatment for those traveling the roadways during winter weather: provide plenty of room for snow equipment to operate! Do not tailgate plows or spreaders. Should they have to hit the brakes, your vehicle could easily become a permanent part of the spreader, especially given the reason they are out there in the first place - slick streets! So, exercise caution, give them room to operate, and be sure to say thanks the next time you see public works personnel making the roadways safer for all of us! 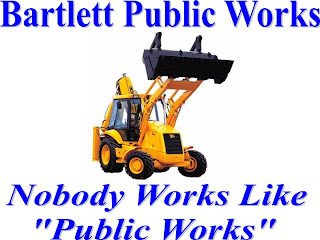 Many thanks to Mike Adams of Bartlett Public Works for his insight and recollection of last week's events and allowing me to share them with you. Get the latest weather conditions, forecasts, radar, and much more by checking out MemphisWeather.net on Facebook and Twitter! 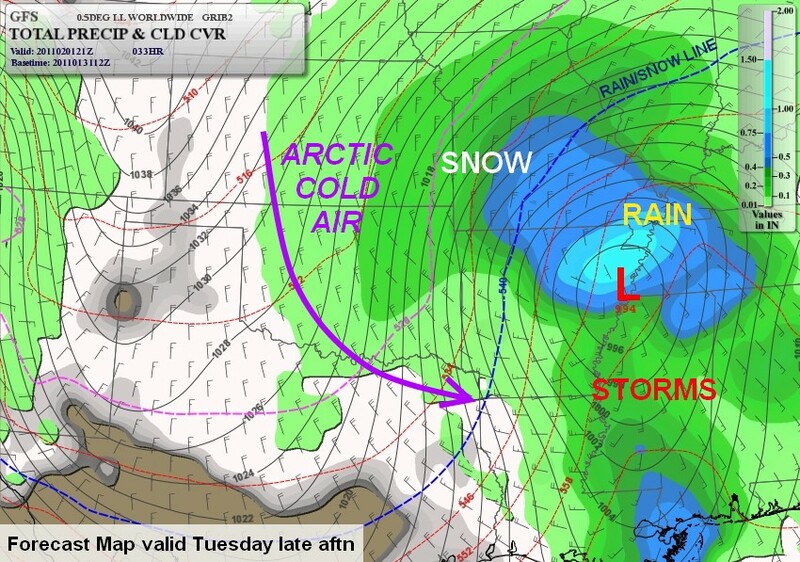 .THE COMBINATION OF A STRONG ARCTIC COLD FRONT AND A FAST UPPER LEVEL DISTURBANCE WILL BRING WINTER PRECIPITATION TO THE MIDSOUTH ON THURSDAY. PRECIPITATION WILL MAINLY BE SNOW... HOWEVER AN INITIAL BRIEF PERIOD OF SLEET AND POSSIBLY FREEZING RAIN MAY FALL RIGHT ALONG THE FRONT AS IT SURGES SOUTHWARD. SNOW WILL QUICKLY TAPER OFF THROUGHOUT THE EVENING FROM WEST TO EAST AS THE STORM LIFTS INTO THE APPALACHIAN MOUNTAINS. 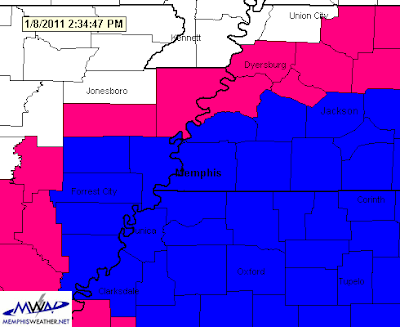 THE NATIONAL WEATHER SERVICE IN MEMPHIS HAS ISSUED A WINTER WEATHER ADVISORY FOR SNOW... SLEET... AND FREEZING RAIN... WHICH IS IN EFFECT FROM NOON TO 9 PM CST THURSDAY. * SNOW TOTALS WILL RANGE FROM 1 TO 3 INCHES. SLEET AND ICE ACCUMULATIONS WILL BE LESS THAN A TENTH OF AN INCH. * TIMING: A WINTRY MIX WILL BEGIN AS EARLY AS NOON ON THURSDAY WITH LIGHT SNOW TAPERING OFF BY 9 PM THURSDAY EVENING. * IMPACTS: TRAVEL CONDITIONS ARE EXPECTED TO BECOME HAZARDOUS THURSDAY AND THURSDAY NIGHT. A COLD FRONT WILL MOVE INTO THE MID-SOUTH THURSDAY RESULTING IN YET ANOTHER ROUND OF WINTRY WEATHER ACROSS THE AREA. PRECIPITATION WILL LIKELY BEGIN AS RAIN ACROSS MOST OF THE AREA. THE MEMPHIS METROPOLITAN AREA WILL LIKELY SEE MULTIPLE FORMS OF FREEZING... FROZEN AND LIQUID PRECIPITATION DURING THE DAY AS TEMPERATURES RISE AHEAD OF THE FRONT... THEN FALL OFF QUICKLY AFTER THE FRONT. MANY LOCATIONS WILL REACH THEIR DAILY HIGHS BEFORE NOON. AS COLD AIR DIVES SOUTH INTO THE REGION THURSDAY AFTERNOON... RAIN WILL CHANGE OVER TO SNOW WITH A POSSIBLE BRIEF PERIOD OF SLEET AND FREEZING RAIN. THIS CHANGEOVER WILL CONTINUE ACROSS NORTH MISSISSIPPI THURSDAY EVENING BEFORE THE STORM MOVES INTO THE APPALACHIAN MOUNTAINS. SOME ACCUMULATIONS OF SNOW WILL BE POSSIBLE ACROSS ALL OF THE MID-SOUTH ALTHOUGH THE GREATEST ACCUMULATIONS WILL LIKELY BE NORTH OF INTERSTATE FORTY. A WINTER WEATHER ADVISORY MAY BE REQUIRED. SLEET AND FREEZING RAIN ICE ACCUMULATIONS ARE NOT EXPECTED TO BE SIGNIFICANT AT THIS TIME. THERE IS STILL SOME LINGERING UNCERTAINTY WITH THIS SYSTEM... MAINLY WITH PRECIPITATION TYPES AND THE TIMING OF THE CHANGEOVER. STAY TUNED TO LATER FORECASTS AND PRODUCTS FROM THE NWS AND MEMPHISWEATHER.NET FOR THE LATEST INFORMATION. Now that the last of the well-built snowmen from last week are dwindling away as temperatures reach the 40s and rain washes away their remnants, it's time to talk about the next chance of snow, right?? As I understand, that's what is on people's minds who have checked out the extended forecast. So we'll dive right in. The set up is this: a trough of low pressure will move into the region Thursday, bringing pretty high rain chances. If the rain starts early enough (which is not my current thinking, but could change), there is a chance it could be freezing rain early in the morning before temperatures climb above freezing by mid-morning. A cold front will then swing quickly through the region Thursday afternoon. Very cold air will follow the front and any remaining precipitation behind the front is expected to transition from rain to a wintry mix, then to snow. The NWS has provided a good visual included below. MWN will keep close tabs on the developing scenario as the week goes along, but for now there appears to be a decent chance of some sort of accumulation from late Thursday afternoon through Thursday evening in the metropolitan area. Amounts, exact timing, and precipitation types are yet to be refined. I would, however, give this system a much lower chance of producing significant snow than we had last week (January 9-10). A dusting might be OK though huh? What do you think - are you ready for more snow? Southeast U.S. snow cover still evident from 22,000 miles up! Snow remains on the ground across much of the interior southeast more than 72 hours after the winter storm dropped 3-10"+ across the region, thanks to bitterly cold temperatures. Visible satellite imagery taken at 12:45pm today (and marked up by MWN) shows the snow cover well. Some thin clouds are skirting by in the northern portion of the image as well as over the Gulf of Mexico, otherwise all areas within the blue outline are snow as seen from 22,000 miles up. Click the image for a larger version. Notice the darker "rope-like" lines in the snow - they are unfrozen waterways (rivers). Also, while it appears much more snow is present across east AR and northwest MS than in northeast MS, the opposite is actually true. Because of the flat farmland in AR and northwest AR, the snow is more readily visible than forested areas of northeast MS, where the tree canopy obscures snow on the ground below! 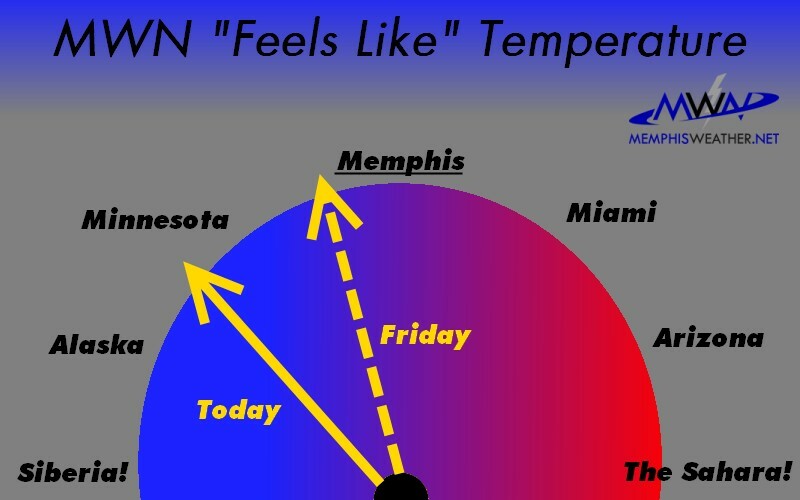 Get the latest weather conditions, forecasts, and much more by checking out MemphisWeather.net on Facebook and Twitter! Finally, it's always interesting to look at actual pictures of snow from space. Here's a visible imagery shot taken just before the sunset on Tuesday, as clouds cleared out from our area, from the GOES-East spacecraft. 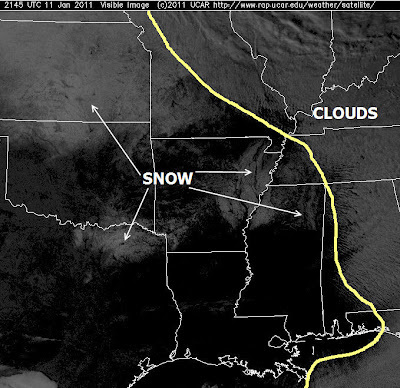 Areas east of the yellow line are cloud-covered, areas west are clear, making it easy to pick out the snow, especially over the Mississippi Delta (southwest of Memphis) and eastern Arkansas. THE COMBINATION OF MELTING SNOW THAT OCCURRED TUESDAY AFTERNOON AND FALLING TEMPERATURES WILL RESULT IN BLACK ICE DEVELOPING ON AREA ROADWAYS OVERNIGHT INTO WEDNESDAY MORNING. BLACK ICE FORMS WHEN WATER REMAINING ON ROADWAYS FREEZES IN THE PRESENCE OF BELOW FREEZING TEMPERATURES. THIS ICE IS HIGHLY TRANSPARENT AND VERY DIFFICULT TO SEE AS COMPARED TO SNOW COVERED ROADS. BLACK ICE CAN LEAD TO DANGEROUS DRIVING CONDITIONS AS DRIVERS MOVING AT NORMAL HIGHWAY SPEEDS MAY SUDDENLY ENCOUNTER THESE ICY SPOTS WITH LITTLE OR NO ADVANCED WARNING. LOW TEMPERATURES TONIGHT WILL DROP INTO THE LOWER TO MIDDLE TEENS WHICH WILL ALLOW ANY STANDING WATER ON ROADS TO REFREEZE TO SOLID ICE. BRIDGES ARE MOST SUSCEPTIBLE TO THE FORMATION OF BLACK ICE... AS SNOW MELT CANNOT EASILY RUNOFF FROM BRIDGE SURFACES. THERE HAVE ALREADY BEEN REPORTS OF ICY SPOTS ON ROADWAYS IN OXFORD IN LAFAYETTE COUNTY MISSISSIPPI AND BOONEVILLE IN PRENTISS COUNTY MISSISSIPPI. ICY SPOTS ON ROADWAYS WILL BE POSSIBLE ACROSS THE ENTIRE MID SOUTH FOR THE REMAINDER OF TONIGHT INTO WEDNESDAY MORNING. IF YOU MUST TRAVEL TONIGHT INTO WEDNESDAY MORNING... PLEASE BE PREPARED FOR POTENTIAL ICY SPOTS ON ROADWAYS... ESPECIALLY IN AREAS OF SNOW MELT AND BRIDGES... AND EXERCISE EXTREME CAUTION. The Mid-South was blanketed by an early January snow storm during the evening hours on January 9th into the early morning of the 10th. Low pressure along the Gulf Coast provided the moisture while an upper-level low transiting north Mississippi brought the necessary lift that resulted in heavy snow and significant accumulations, especially near the track of the upper level low. The entire region ended up under a Winter Storm Warning and, generally, final amounts were well forecast. As evidence, see MWN's post from Thursday morning indicating possibly enough snow to close schools and pretty much describing the scenario exactly as it unfolded, including timing. That afternoon, the NWS called for 2-5" across west TN and 5-8" south of I-40. A Friday morning update by MWN hit the timing and expected snow amounts over 48 hours in advance, while also predicting the afternoon issuance of a Winter Storm Watch. MWN's Saturday morning update was again on track, with a slight underestimation of actual snow amounts. The NWS issued a Winter Storm Warning Saturday afternoon, forecasting 3-6" for the metro area. 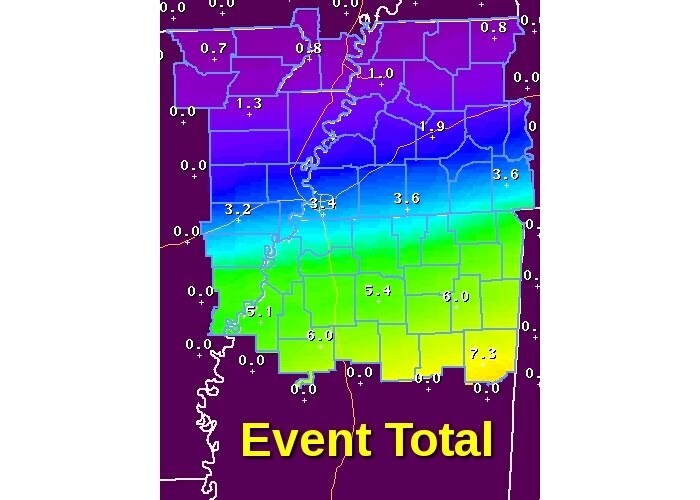 Below is a graphic produced by the National Weather Service in Memphis showing accumulations across the region, as well as a listing of individual reports received. Click here for the full graphic. Snow has moved out of the region this morning except for some flurries in some parts of the Mid-South. As the main weather system departs, another less potent one will swing by to our north over the next 24-30 hours. Much of the mid and upper-level moisture is departing with the overnight weather system, leaving only low-level moisture to work with. Thus the threat has shifted to freezing drizzle. 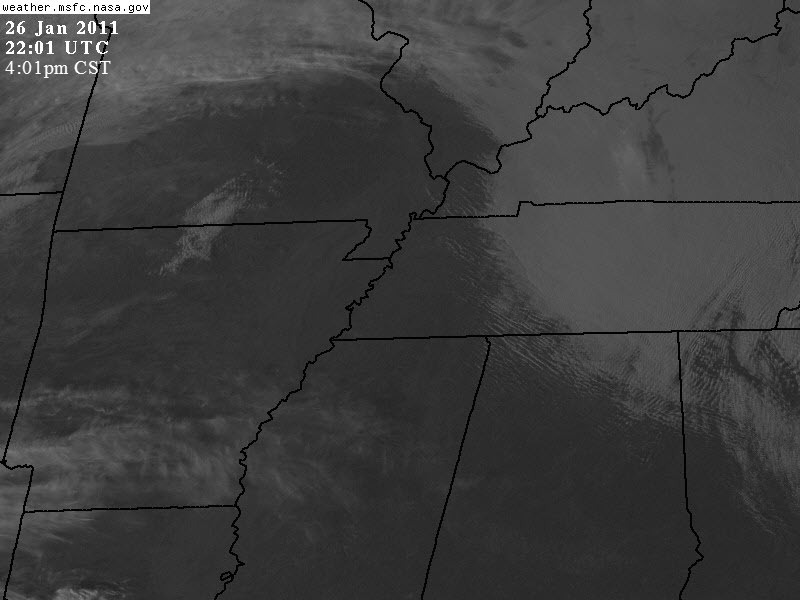 .STRONG LOW PRESSURE SYSTEM IS QUICKLY EXITING THE MID-SOUTH THIS MORNING. HOWEVER ANOTHER DISTURBANCE WILL SWING THROUGH THE AREA TODAY THROUGH TUESDAY MORNING. THE PRIMARY FOCUS WITH THIS SYSTEM WILL BE FREEZING DRIZZLE INSTEAD OF HEAVY SNOW. AREAS OF FREEZING DRIZZLE WILL ACCOMPANY THIS SYSTEM AND AFFECT PORTIONS OF THE MIDSOUTH TODAY BEFORE TAPERING OFF TUESDAY MORNING. LIGHT SNOW MAY ALSO MIX IN ESPECIALLY DURING THE OVERNIGHT HOURS. THE NATIONAL WEATHER SERVICE IN MEMPHIS HAS ISSUED A WINTER WEATHER ADVISORY FOR FREEZING DRIZZLE... WHICH IS IN EFFECT UNTIL NOON CST TUESDAY. THE WINTER STORM WARNING HAS BEEN CANCELLED. * ICE ACCUMULATIONS: LITTLE IF ANY ICE ACCUMULATIONS ARE EXPECTED AREA WIDE. * TIMING: LIGHT FREEZING DRIZZLE WILL BEGIN LATE THIS MORNING AND WILL BE INTERMITTENT THROUGH THE DAY. VERY LIGHT SNOW MAY MIX IN ESPECIALLY DURING THE OVERNIGHT HOURS. ALL PRECIPITATION SHOULD END BY LATE MORNING TUESDAY. * IMPACTS: ROAD CONDITIONS WILL LIKELY WORSEN THROUGH THE DAY AS FREEZING DRIZZLE COMMENCES. THE DANGEROUS TRAVEL CONDITIONS WILL LIKELY CONTINUE INTO TUESDAY AS TEMPERATURES WILL STRUGGLE TO REACH THE FREEZING MARK IN MOST AREAS. With snow falling across the Mid-South as this is typed, many folks are trying to figure out how much snow they are actually getting. This is not a complicated matter and anyone with a little common sense and a ruler can do it! Here are some steps and tips to help out. The best way to measure snow is on a snowboard, or some type of large flat board like a cutting board or plywood, preferably 24" x 16" or larger. If you don't have one available, measure on a flat surface, not on the grass (unless the grass is very short or you have bare ground). Preferably, take several measurements from various locations and average them. Measure using a standard ruler or yardstick and provide your measurement in tenths of an inch (quarter of an inch will do, but tenths are preferred). Measure away from structures like buildings that could affect the amount due to wind currents or drifting. Do not measure under or around trees as the branches will "catch" some of the snow and your measurement will be low. Do not measure on thick grass. Your ruler will extend down into the grass, below the snow. Get down close to the ground so that you are measuring at eye level. Looking from above leads to enhanced measurements. If you use a snowboard, it's a good idea to mark it with a small flag or reflector as it will likely get buried by new snow. To get new snowfall since the last measurement, clear off a small section of your snowboard each time you measure. On subsequent visits, measure the previously-cleared area for "new snowfall" and the untouched area for "total snowfall." Hopefully these tips will help you in measuring your snowfall and enjoying the winter weather even more! .A LOW PRESSURE SYSTEM WILL TRACK ALONG THE GULF COAST TONIGHT. SNOW WILL CONTINUE TO SPREAD NORTHEAST THROUGH THE EVENING. SNOW WILL CONTINUE THROUGH TONIGHT AND WILL BECOME HEAVY AT TIMES... BEFORE TAPERING OFF BEFORE SUNRISE. AS THE SNOW ENDS EARLY MONDAY MORNING... AREAS OF FREEZING DRIZZLE ARE LIKELY TO PERSIST THROUGH MONDAY. ANY FREEZING DRIZZLE WOULD LIKELY PROLONG THE DIFFICULT TRAVEL CONDITIONS... ESPECIALLY ON BRIDGES AND OVERPASSES. THE WINTER STORM WARNING IS NOW IN EFFECT UNTIL 6 AM CST MONDAY. * SNOW ACCUMULATIONS: 4 TO 8 INCHES... WITH LOCALLY HIGHER AMOUNTS ABOVE 8 INCHES POSSIBLE. * TIMING: SNOW WILL BEGIN EARLY THIS EVENING AND CONTINUE THROUGH TONIGHT. SNOW WILL BE HEAVY AT TIMES WITH A FEW THUNDERSTORMS ALSO POSSIBLE. ANY THUNDERSTORMS WOULD SIGNIFICANTLY ENHANCE HOURLY SNOWFALL RATES. * IMPACTS: ROAD CONDITIONS ARE EXPECTED TO DETERIORATE RAPIDLY BY MID-EVENING. THE DANGEROUS TRAVEL CONDITIONS WILL LIKELY CONTINUE THROUGH MONDAY AS SNOW TRANSITIONS TO FREEZING DRIZZLE MONDAY MORNING. Stay updated with the latest on the winter storm by checking out MemphisWeather.net on Facebook and Twitter! .A LOW PRESSURE SYSTEM WILL TRACK FROM THE TEXAS GULF COAST SUNDAY MORNING TO THE SOUTH CENTRAL LOUISIANA COAST SUNDAY AFTERNOON AND THE WESTERN FLORIDA PANHANDLE BY LATE SUNDAY NIGHT. SNOW WILL DEVELOP NORTH OF THE SYSTEM EARLY SUNDAY MORNING NEAR THE ARKLATEX REGION AND SPREAD NORTHEAST THROUGH THE DAY INTO PORTIONS OF NORTHERN MISSISSIPPI LATE SUNDAY AFTERNOON. THE SNOW WILL THEN CONTINUE TO OVERSPREAD THE REST OF THE MID-SOUTH BY SUNDAY EVENING. SNOW WILL CONTINUE SUNDAY NIGHT AND BECOME LIGHTER INTO EARLY MONDAY MORNING AS THE STORM PUSHES EAST OF THE AREA. THE NATIONAL WEATHER SERVICE IN MEMPHIS HAS ISSUED A WINTER STORM WARNING FOR HEAVY SNOW... WHICH IS IN EFFECT FROM 6 PM SUNDAY TO 6 AM CST MONDAY. THE WINTER STORM WATCH IS NO LONGER IN EFFECT. * SNOW ACCUMULATIONS: 3 TO 6 INCHES...WITH LOCALLY HIGHER AMOUNTS POSSIBLE. * TIMING: SNOW WILL BEGIN EARLY SUNDAY EVENING AND CONTINUE THROUGH SUNDAY NIGHT. SNOW MAY BE HEAVY AT TIMES WITH A FEW THUNDERSTORMS ALSO POSSIBLE. ANY THUNDERSTORMS WOULD SIGNIFICANTLY RAISE HOURLY SNOWFALL RATES. EXPECTED BY MID EVENING SUNDAY. THE DANGEROUS TRAVEL CONDITIONS WILL LIKELY PERSIST AT LEAST INTO THE MONDAY MORNING RUSH... AND POSSIBLY THROUGH THE DAY AND BEYOND. If a picture is worth a thousand words, then this may end up being a novel, but I think it's better to snow than to tell. Plus, the graphics get more interesting as we draw closer to the winter weather event that will move into the region Sunday. First, not a lot has changed since yesterday with the computer models still vacillating somewhat on snow totals, but coming to a consensus on timing. The key, as I see it, to snowfall amounts is going to be the ultimate track of the upper-level energy associated with this system, with a secondary influence from the amount of convection ongoing along the Gulf Coast. You'll see what I mean in the model solutions below. The surface low appears to take a track along or just south of the coastline of LA/AL/MS/FL. Let's start with the computer model runs from overnight, two of which are depicted above. On the left, the NAM model, and on the right, the GFS. Not shown are the forecast tracks of the upper-level energy, but that is the primary difference between the models, causing the significant difference in snow totals. The track of the upper low is the favored position of heavier snow due to the associated dynamics and lift available. You can probably guess the track of the upper low in each model - the NAM takes it south of the metro area, thus forecasting only 1-2" for the immediate area, while the GFS takes it over the heart of the city and therefore indicates a swath of 3-5" totals over the metro. I still believe (my thinking hasn't changed much the past 48 hours) that we will see a combination of the two above - a slightly more northerly track of the upper low (similar to the GFS), but with the gradation of the snow amounts that the NAM provides. I think we could see a fairly narrow (perhaps just 50-100 miles) swath of enhanced snow totals along the upper low track, which will likely set up over northern MS. A wider swath of general 2-3" totals will likely occur on the north side of the heavy band, covering much of the metro area including Memphis and Shelby County. This is similar to what the NWS has conveyed with the graphic below, though I think the upper end snow amounts depicted are a little aggressive. I promised graphics, so here are some more that are interesting and support my position fairly well. The first (4-panel below) shows the probability of snowfall totals of 2" (upper-left), 4" (upper-right), 6" (lower-left), and 8" (lower-right). This supports the heavier swath occurring over north MS, but also a potential of fairly significant snow for southern west TN, where the Winter Storm Watch is currently in effect. Finally, from the National Weather Service, their composite graphic showing (from upper-left to lower-right) probabilities of 4", 8", and 12" snow and one-quarter of an inch of ice. It shows a moderate probability of 4" of snow up to the TN/MS state line and low probability (but not non-existent) of 8". A significant ice storm will set up to our south across northern LA, central MS and AL, and into northern GA. Thankfully we'll stay cold enough to get all snow from this storm! 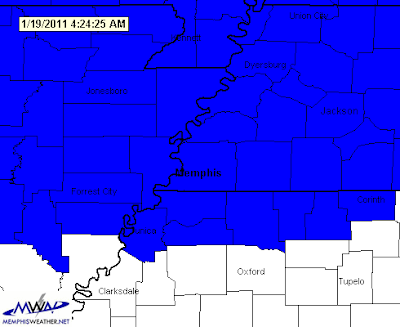 Stay with MemphisWeather.net for the latest on this developing winter weather scenario. Get the latest weather forecasts and winter weather updates, plus much more, by checking out MemphisWeather.net on Facebook and Twitter! MISSISSIPPI LATE SUNDAY AFTERNOON. THE SNOW WILL THEN CONTINUE TO OVERSPREAD THE REST OF THE WATCH AREA BY EARLY SUNDAY EVENING. SNOW WILL CONTINUE SUNDAY NIGHT AND TAPER OFF EARLY MONDAY MORNING AS THE STORM PUSHES EAST AWAY FROM THE AREA. THE NATIONAL WEATHER SERVICE IN MEMPHIS HAS ISSUED A WINTER STORM WATCH... WHICH IS IN EFFECT FROM SUNDAY EVENING THROUGH LATE SUNDAY NIGHT. * SNOW ACCUMULATIONS: 3 TO 6 INCHES... WITH THE HEAVIEST LIKELY ACROSS NORTHERN MISSISSIPPI. * TIMING: SNOW WILL BEGIN EARLY SUNDAY EVENING AND CONTINUE THROUGH SUNDAY NIGHT. SNOW MAY BECOME HEAVY AT TIMES LATE SUNDAY EVENING. * IMPACTS: SNOW COVERED ROADS AND DANGEROUS TRAVEL CONDITIONS ARE EXPECTED BY MID EVENING SUNDAY. THE DANGEROUS TRAVEL CONDITIONS WILL LIKELY PERSIST AT LEAST INTO THE MONDAY MORNING RUSH...AND POSSIBLY THROUGH THE DAY AND BEYOND. As of this 12:30pm Friday, conditions are still coming together for a potential winter storm across the Mid-South on Sunday night. The images above provide just 3 of many solutions we weather guys and gals are looking at regarding the storm. The top two images show snowfall totals from U.S.-based computer models, while the bottom image is the National Weather Service forecast for expected snow amounts. The computer models are re-run every 6 hours and solutions change every time they are run, but they are beginning to hone in on the big picture, which includes surface low pressure moving along the Gulf Coast and an upper-level low moving across north Mississippi. As far as timing, light snow showers could begin moving in from the south and west Sunday afternoon but accumulating snow should hold off until after dark Sunday evening. Most of that snow will be done by rush-hour Monday morning. I expect to see Winter Storm Watches posted for part of the area later this afternoon. You may wish to follow @shelbyalerts for winter weather watches/warnings for Shelby County via Twitter (a free service of MemphisWeather.net) or sign up to receive them by e-mail for any metro county by clicking here. Get the latest weather updates and forecasts and much more by checking out MemphisWeather.net on Facebook and Twitter!